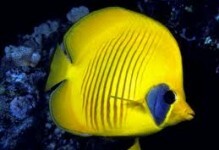 The Auriga Butterflyfish, also known as the Threadfin Butterflyfish, is one of the more popular and readily available butterflyfish. 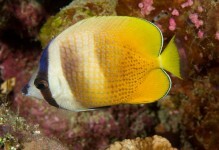 Generally a hardy species, in the wild it is found on inner and outer reef slopes. 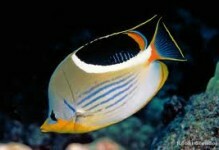 As with many fish, the Threadfin Butterfly’s color and markings can vary with the region of origin. 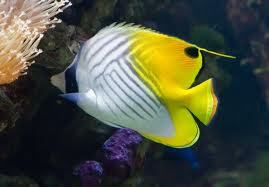 Red Sea specimens tend to lose the eyespot (false eye to confuse predators) on the dorsal fin. 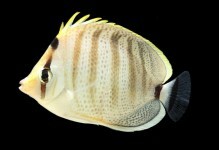 The Auriga Butterflyfish’s diet should primarily consist of plankton frozen, freeze-dried, fresh or flake food is readily accepted. 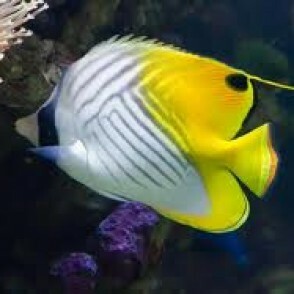 Also provide regular vegetable food source andvitamin-boosting supplements.